GABA, postsynaptic. The molecular structure of the postsynapse has long been a mystery. Why do receptors cluster at a particular site and don’t simply float around all over the plasma membrane? The identification of postsynaptic scaffolding proteins answered some of these questions. However, it also became clear that inhibitory synapses are completely different from excitatory synapses. Now, a recent paper in Human Molecular Genetics finds that exonic deletions in gephyrin, the main structural protein of the inhibitory synapse, predispose to various neurodevelopmental disorders. ZMBH, Heidelberg, Spring of 2000. During my doctoral thesis in Heidelberg, I attended various lectures on pre- and postsynaptic membrane proteins. The discovery of all these large, previously unknown proteins with interesting-sounding names like piccolo or bassoon was in full swing. In addition, I learned that there are specific genes in the inhibitory synapse that were only discovered some years earlier. In the excitatory postsynpase, PSD-95 was the main scaffolding protein. However, at inhibitory synapses, i.e. the site where GABA receptors cluster, other proteins appeared to be more prominent. I remembered two of them because of their exclusive name, gephyrin and collybistin. Gephyrin was named after the ancient Greek word for bridge (gephyra), while collybistin got his name from collybista, the latin word for money-changer. Both references pretty much refer to what these proteins do. 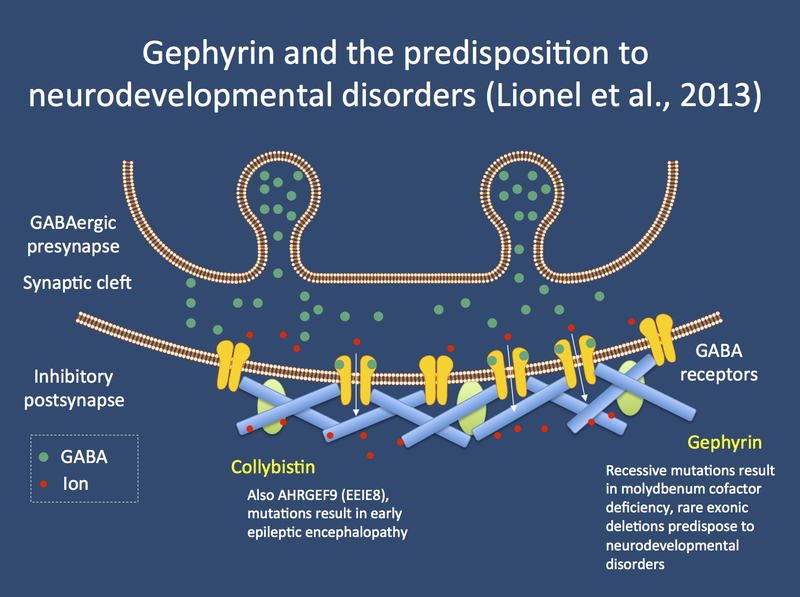 Gephyrin is a scaffolding protein that bridges GABA receptors, while collybistin is brain-specific guanine nucleotide exchange factor (GEF), which is crucial for inhibitory synapse development. The exotic nature of the names made them stick in some part of my Papez circuit (possibly with their own help involved). You could have quizzed me at any time about proteins of the inhibitory postsynapse and I could have named both proteins. However, I had no further contact with gephyrin and collybistin until 2013. Rediscovery. Exonic microdeletions in genes coding for structural synaptic proteins including neurexins and neuroligins are still an emerging theme in 2013. Rare CNVs in these genes predispose to a variety of neurodevelopmental disorders including autism, schizophrenia, intellectual disability and epilepsy. However, there was little mention of the two postsynaptic proteins in the inhibitory synapse. Nevertheless, in the last decade, there was some evidence accumulating for a role of both proteins in human disease. Recessive mutations in GPHN, the gene encoding the human gephyrin protein were found to be a rare cause of molybdenum cofactor deficiency, a fatal disease resulting in severe neurologic damage and death in early childhood. In addition, mutations in ARHGEF9, the human gene encoding collybistin, were found to cause X-linked epileptic encephalopathy (EIEE8). Both examples underline both the importance of inhibitory synapse formation and the additional functions that some of these proteins may have. Exonic microdeletions in GPHN. Lionel and collaborators now present a group of seven patients with various exonic deletions involving the GPHN gene. While the phenotypic features of these patients may still be refined in the future, the spectrum covers a range of neurodevelopmental disorders previously associated with other microdeletions, including autism and schizophrenia with concomitant epilepsy. Their paper underlines the fact that reviewing a large number of patient cohorts for rare deletions can result in the identification of novel disease genes. Except for some partial duplications, which may not disrupt gene function, the Toronto Database of Genomic Variants as implemented in the UCSC Genome Browser does not report CNVs in GPHN, the Exome Variant Server reports various missense mutations, but no frameshift indels or stop mutations in this gene. Therefore, there is quite some evidence that microdeletions in GPHN are disease-related. The inhibitory synapse. Gephyrin and collybistin are proteins exclusive to the inhibitory postsynapse. While mutations in both genes are already known to cause severe neurological disorders, a recent study by Lionel and collaborators shows that rare microdeletions in GPHN, the gene encoding the human gephyrin protein, are associated with autism and schizophrenia. The bigger picture. Disease-related microdeletions are always infrequent events and their frequency rarely exceeds the 1% mark in patient cohorts. In addition, there is quite some genomic variation in controls. Both factors make it difficult to distinguish pathogenic variation from unrelated, “private” variants. While the frequency of microdeletions is significantly elevated on a group level in patients with various neurodevelopmental disorders, it will be the task of future studies to break this down into meaningful candidate regions in individual patients. The study by Lionel and collaborators now elevates GPHN from candidate status to a disease-related gene, which will help interpreting genetic findings affecting this gene. With a constant trickle of other genes systematically investigated, some of the missing heritability can hopefully be explained in the future. This entry was posted in 2013, autism, Epileptic encephalopathy, Papers and tagged ARHGEF9, autism, Collybistin, EIEE8, GABAergic presynapse, Gephyrin, GPHN, microdeletions, Neurexin, Neuroligin, scaffolding proteins, schizophrenia. Bookmark the permalink.